You can write a personal journal in the form of a blog. Until recently, I used to think this was the most common purpose for a blog. That each day, at some point, you jotted down some of the highlights or anticipation of the day. And many people do this, not even realising they’re actually writing a journal. But the first time I did the A-Z challenge I became impressed with the creativity people showed in choosing themes they could follow for a month, one alphabet letter at a time. Of course, the alphabet idea is just a gimmick, but it actually works well even without the challenge. The principle of going with one letter at a time prompts you to think out of the box.Let’s take a look at other types of journaling you can do on your blog. You can write a Travelblog. Have you ever written a travelblog? Here's how. 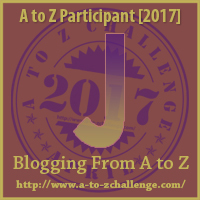 #atozchallenge Click To TweetOne writer in the A to Z challenge was traveling across the States with her husband. She wrote a daily blog on a new place she’d seen, following the letters of the alphabet. What if there wasn’t a suitable town for that letter? She came up with a creative title. e.g. if I were writing about the city where I live, I could say H is for Horse Statue in City Centre, or I is for the Indian Ocean at the bottom of my road. Last year, my brother and sister-in-law did an overland trip to East Africa over a period of several months. They built a blog for the family and their friends to follow their adventures. They didn’t follow the alphabet, but there were regular posts with incredible photographs, telling of their wonderful sightings of wild animals. We read of the amazing places they visited and of some of the drama they faced, especially with customs officials or their 4 X 4. Once the trip came to an end, so did the journal. But they have it as a permanent record for the future. Your blog can tell the story of your life. where you follow the different members of the family, giving key bits of information that you know to be true. It is amazing sometimes the facts in a family that get skewed through the years. Imagine the surprise I had one day when I learned my 30-year-old son believed he was born in the city where his brother had been born. He had gone through his life believing that was his birthplace. His true place of birth only came out by accident! So if you’re journaling about the family, be certain of your facts. Were there unusual circumstances to your birth? In today’s global society, more than ever before, families are fragmented, and a Life’s Blog could be a great way to bridge the gap between the generations. Journaling is a great way to brainstorm. If you need to work through a decision or a relationship that is giving you problems, or even memories you want to examine closely, try typing as fast as you can. Forget about grammar or spelling. Just get your thoughts and emotions down, then go back and read it. Save it where you can re-read it at a later stage. Once again, privacy would be important. Every day before you switch off your computer, you could quickly jot down two or three things that went well with your day. It may just be that you woke up without a headache for the first time this week. Or that you got the kids off to school without a screaming match. Don’t forget the occasional (okay, maybe very occasional) complement that has come your way. When you have a down day, it’s great to glance back and read about the really great things that happened on that day in the past. is another way of “keeping a diary”, and you will want to keep it to yourself. Recording the highs, lows, or mistakes you made can remind you of actions you don’t want to repeat, good moments you want to treasure, and achievements you’re proud of. It will help you be more aware of the things you’re good at, and situations that bring out the worse in you. And if it’s private, you have a space to vent if you need to get something off your chest. How about a weight-loss journal? before starting your journal. Do you want to keep it private? Or restrict it to friends only? Are you going to blog openly for the world to read? Nothing wrong with that, but obviously watch what you say. Journaling does not have to be a daily task. Nor do you need to record everything that happens. It doesn’t matter if you skip a day or two. If you decide to leave out some aspect of your life, that’s also fine. Select a goal, and then go with it. You may decide to write every 2nd day, or each weekend, or even the first of every month. The important thing is to decide how often you will write, and stick to it. Otherwise, you will lose momentum. How is this going to help you build a better blog? As I said at the beginning of this series, not all bloggers are authors. But even if you are, if people know they can join a blog, for example, to help them lose weight, you may be surprised how many sign up to follow you.Just the act of writing regularly in your journal will improve your writing ability.You may find events or people that you want to share with the world, even if your journal is private. A simple copy/paste and a bit of an edit and it can go into your public blog, or you may even use it as an article and seek publication. Do you already keep a journal? Is it online, or in your bedside table? Do any of these ideas appeal to you? Is not the poet bound to write his own biography? Is there any other work for him but a good journal? —Henry David Thoreau, from his journal. I’m not a journal keeper either however I do share some events on my blog such as when I travel to places my ancestors have lived no family history conferences. Yes, my journaling comes in fits and starts. I write them when there’s something going on in my life mainly! Great post with lots of informative points. Thank you so much for your visit and comments. Have a great day! Good tips. I often search my blog to find out what year we did what/where during our travels. Thanks for the visit! Have a Happy Easter! No,I do not maintain a journal. You are right that those who do, end up with preserving memories fora lifetime. The results are especially great on a global scale. It draws us together I’m a beautiful way! Thank you Klaudia. A very happy Easter to you as well. Some excellent ideas, Shirley. I guess that I am doing a retroactive journal this year for the A-Z challenge as I write about things from my first four years in Ecuador. I will continue after the challenge is done, just not daily. Thank you! Yes, I’ve just visited your A-Z Journal. Wow! I could never do a jump like that. Amazing. I have a funny story about personal journals…well a diary…i had a fancy diary in boarding school and someone went into my locker and tore out the page where I wrote names of those that owe me money….I decided not to keep a diary after that incidence…..
Oh my, that would cure me of keeping a diary too! Have a very Happy Easter! Wow. A lot of good ideas. I’ll have to come back and do some of my own brainstorming. Hi Shawna. Thanks for the visit. You’re welcome to come back any time! These are some really great ideas!! Thanks for sharing! I’m amazed your son didn’t know his birthplace…is that no listed on his birth certificate, then? I’m sure you’re not as amazed as my husband and I were. Yes, it was on his birth certificate but he probably never looked at it! He was in his twenties and hadn’t done anything that needed it. It’s not as if we hadn’t told him but how often do you tell your kids where they were born? You presume they know! At least, we did. I do not keep a journal, although I have started to more than once. I have better luck with blogging. I do not really do a journal blog, but i have done various posts about my life, including one A to Z about various streets in my life that covered pretty much my whole life. That’s an ambitious theme, wow! I’m amazed at the ideas people come up with! Have a great Easter. Thank you for the visit to my humble blog. Some very useful info for folk on how to use their blog although I long ago chose a rather personal and somewhat odd route with my own which I enjoy. If there is one thing that keeps us blogging its enjoying creating it, well that and all the money. Good luck with the rest of the alphabet I hope it goes well. Haha. Yes, definitely for all the money! Thanks for the visit. I keep a personal handwritten journal Shirley that is just for me – sort of a weekly record of my rather unexciting life 🙂 My blog is a bit of an overview of all that journalling and life have taught me. Thanks for the visit Leanne. Yes, I tend to keep a handwritten journal at times, but I’m not terribly faithful at it. Yet, there is so much we can do using our blogs if we so desire. Another pin for my blogging board. Although I never kept a diary or journaled, I’ve found my blog is a wonderful way to keep track of events in my life. As a gardener, I participate in a monthly meme called Garden Bloggers Bloom Day, and I now have nearly seven years of a monthly flower garden journal online. Wow, your Garden Blog sounds amazing. Thank you for sharing. I don’t keep a regular journal either. I journal when I travel, or when I have something worth sharing with people. 🙂 Feel free to disagree with Mr. Thoreau – I just put that out there to see if people agreed or not. Clearly, you don’t! Have a great week.